Simmons and Sealy are both very popular mattress brands that have been deemed as the best by numerous consumers. You will need to research many key aspects in order to figure out which brand is best suitable for your needs. We will help you in this regard. 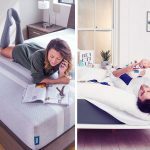 This article compares key aspects of both of these brands in order to make your mattress buying decision easier. This following section reviews Simmons Mattress that has features that appeal to individuals who are looking for a natural, healthy mattress. Simmons mattress cover features a quilted design that has a blend of polyester (30%) and lyocell (70%). This combination creates a breathable and soft cover. From an aesthetic point of view, the cover brings a modern touch by utilizing a traditional design. Simmons did a good job designing a well-rounded cover with a great overall look. Simmons mattress features five distinct layers. The top layer has an intricate design as it is made of white modal yarn. This material is naturally durable and soft which ensures maximum sleep comfortably without overheating. SurfaceCool Plus Fiber is the second layer of the mattress. It is vertically oriented and made of Tencel to maximize airflow. The third layer is made of Comfort Foam which is quite common in firm mattresses. This layer adds firm yet soft support to the mattress. The fourth layer is also made of comfort form but it is relatively thin. The final layer of the mattress is made of Micro Diamond Memory Foam. This foam helps move body heat away and maintain greater cooling throughout the night. 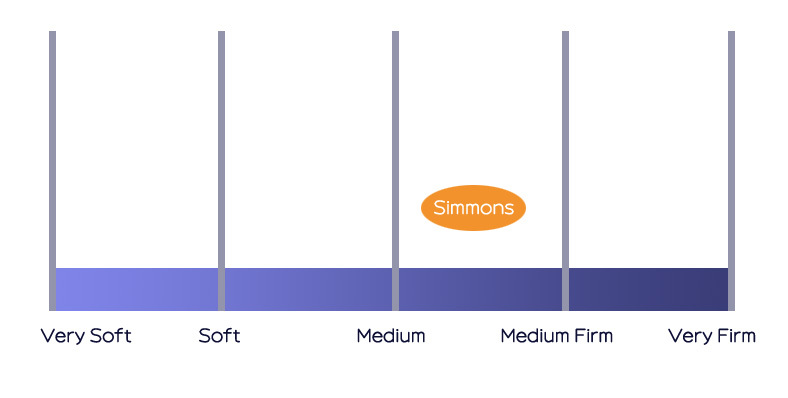 Simmons mattress offers medium level firmness. If you sit on the edge of this mattress, it will feel comfortable but a bit sturdy. It’s not too soft and not too firm. The mattress offers good supportive pressure relief to lower back and shoulders. Your body will align very even on it. Overall, this mattress is a good option for back and side sleepers who like medium firmness. The entire mattress is encompassed with AirCool Beautyedge Foam Encasement. It offers additional support to the edge of the mattress and its pinhole ventilation allows for greater airflow and prevents heat retention. Simmons is a mattress brand well-known for manufacturing durable and high-quality products. Five distinct layers with quality materials along with reinforced border edges ensure maximum mattress longevity. Although Simmons offers a 100-night trial period, don’t expect to get a refund if you don’t like the product within the trial period. Only exchanges are allowed. Simmons mattress comes with 10-years warranty. In case of a product exchange, you will have to pay transportation costs of the new mattress. Sealy is a go-to brand of many individuals when it comes to mattresses. Their mattresses are specifically designed to provide the right amount of support to your body while offering you a high level of comfort at the same time. Sealy mattress features Ultra-Stretch ComfortLoft Cover which is a highly stretchable material designed to work well with the comfort layer of the mattress. It has enhanced conform and contour features so you can enjoy higher comfort. Furthermore, the cover is soft, thin, durable, and looks beautiful. It is tight and secures the mattress superbly. 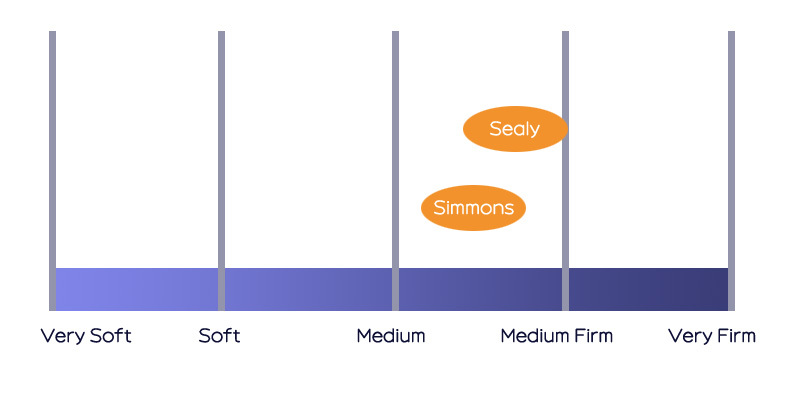 Sealy mattress features three layers that have their own distinct properties. The top layer is 2.5-inch thick and is made of Sealy ComfortSense Foam. It is a state-of-the-art innovation in gel memory foams. This layer responds very well to sleeper’s unique body shape and size. You will surely enjoy a more comfortable night’s rest on this mattress. The second layer is 1-inch thick and is made of Sealy Cool Gel Memory Foam. It is durable, flexible, and provides extra support. Third and final layer is 8-inch thick and is made of SealySupport Gel Base Foam. It offers lasting durability and conforming back support. 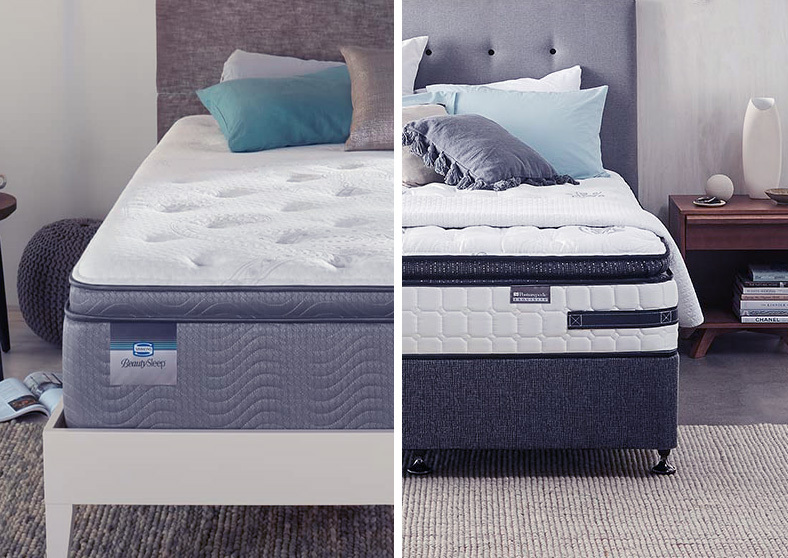 When it comes to support, comfort, and firmness, Sealy mattress offers a personalized sleep experience thanks to its luxurious top layer and gel memory foam that adapts to the curves of your body and the base foam that offers maximum support. The mattress is comfortable yet firm. These properties make Sealy mattress an ideal choice for back and stomach sleepers. However, it may be a bit firmer for side sleepers. 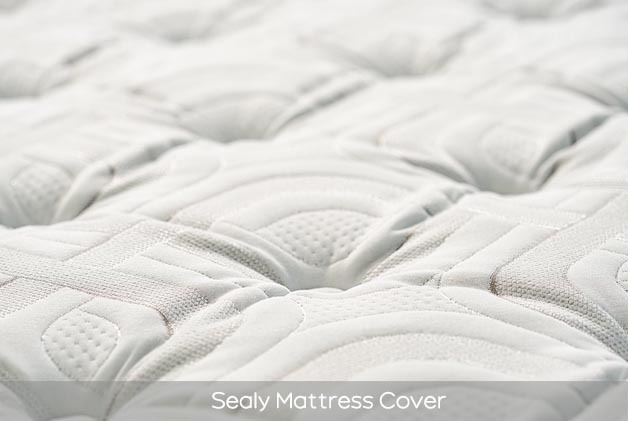 Sealy combines state-of-the-art innovation, precise manufacturing, and industry-leading testing procedures to ensure maximum quality and durability. Sealy mattress’ Reinforced Edge-Technology offers great support for sitting on the mattress as well as allows for superior longevity. This mattress comes with a 100-night trial period. If you are not satisfied with the product within the trial period, you can return it and get a full refund. Sealy offers a 10-year limited warranty on the product. If the mattress becomes ineffective during the warranty period, Sealy will replace it for free. Both Simmons and Sealy have been in the industry for many years. They are considered the best when it comes to quality mattresses. However, there are differences among these two when you consider some certain factors. Design Simmons mattresses feature five layers that are made of NXG Advanced Memory Foam. This foam offers increased airflow and resilience. It is created in a special vacuum-sealed chamber to achieve that. It dissipates heat quickly and also responds to your body’s contours well. Sealy mattresses feature three layers of memory foam that adjust to sleeper’s temperature and weight. The mattress conforms to the curves of your body while you sleep and it aligns your spine and neck to fit your sleeping position. Furthermore, Sealy mattresses also reduce the presence of allergens in the bed. Pros You will like Simmons for its uninterrupted sleep and comfort advantages. You will like Sealy for its high level of support system. Both Simmons and Sealy manufacture their mattresses in factories where the time is very short for the mattresses to let the air out. They are vacuum-sealed minutes after their completion. That’s why you may notice the ‘new mattress’ smell when you unbox the mattress for the first time. This smell is not much of a problem in the summer as you would have your windows open. However, in winter months, it can take many weeks for the odor to completely dissipate. Eco-Friendliness Simmons mattresses are eco-friendly as they are made primarily from natural rubber tree based latex. This material is naturally a mold, dust, and mildew resistant and is also hypoallergenic. Furthermore, wood cellulosic fibers are used for the cover of Simmons mattresses. These fibers are harvested from evergreen trees. Sealy is a mattress brand that prides itself on manufacturing high-quality mattresses while taking the environmental impact into consideration. Certification CertiPUR certified Sealy mattresses just like Simmons, are CertiPUR certified. When it comes to price and value for money, Simmons mattresses are usually more expensive than Sealy. However, the price difference varies for each individual mattress of the brands. The price variety in Simmons mattresses is far more pronounced. Both brands offer trial periods and up to 10-years warranty on their mattresses. Furthermore, both brands also pay great attention to the edge support, comfort, cooling, and eco-friendliness. So both of them offer great value for money. Of course, the final decision is yours. Keep in mind that you can’t go wrong with either one of these brands. Both are quite popular in the market for their perfect mattresses.